I’m not sure what they were trying to do with this poster, but I don’t think it worked very well. There are a couple of things the poster manages to do well. It showcases John Cusack, which will certainly be one of the main draws of the film. Although I don’t particularly like the way that critics quotes look in the poster, they are probably necessary for a smaller movie like this. And there is something about Cusack’s expression as he looks at the balloon that transmits a sense of sadness, and perhaps also of lost innocence. That is interesting. 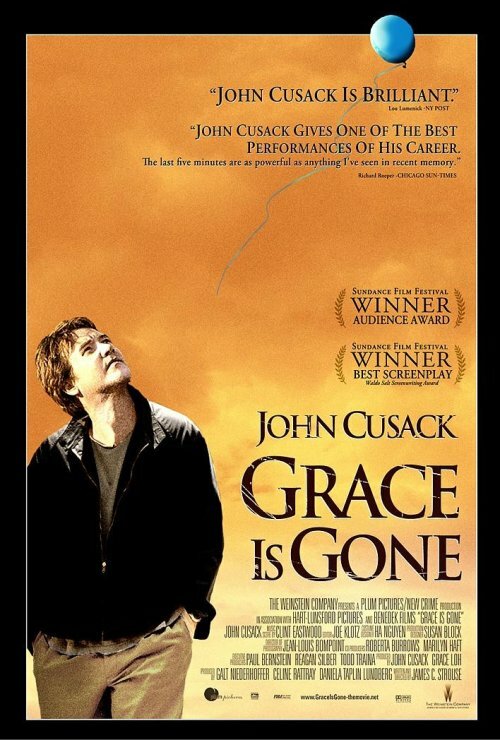 On the other hand, Grace is Gone is a movie about a father whose wife is killed on Iraq. He has a hard time telling his two daughters that their mother is dead, so he ends up taking them to an amusement park. The poster only hints at that premise in a very metaphorical manner. Which can work, if your sacrificing the chance to show what the movie is about in order to use a very memorable and evocative image. But this image is neither. In fact I find it a little bit dull. Making posters for serious dramas is always a bit hard, but I think they could have done better than this. this one made me think of the poster for enduring love.